I am a sucker for those $5/$25 or $10/50 coupons. It just seems like too good a deal to pass up when you can get great sale prices, use your coupons, and then just knock another 20% off the total bill. This week I used a $5/25 at TOP, a $5/25 at QFC and a $10/50 at Safeway. The QFC trip was right when we got home from camping - I bought milk, bananas, grapes, and 8 pounds of bone-in chicken. 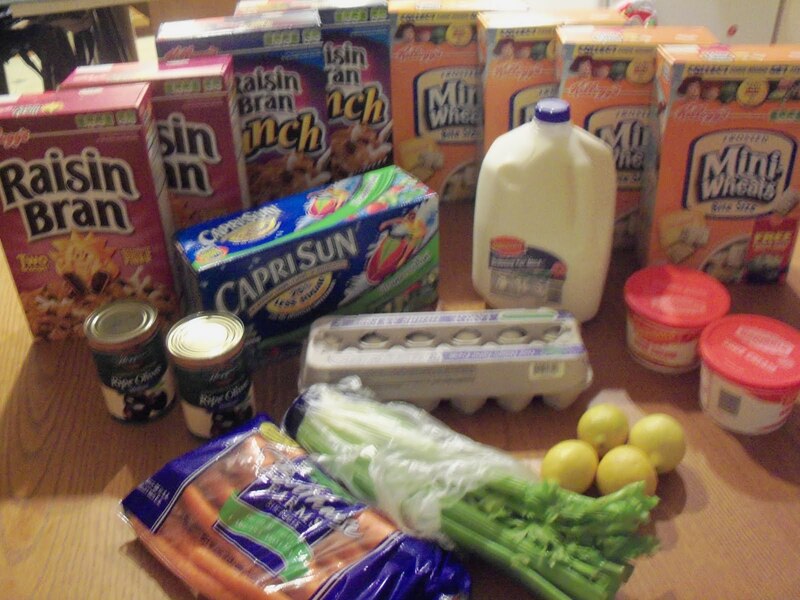 Here is a picture of the Top Foods trip (minus 2 packages of cookies) totalling $20.72. 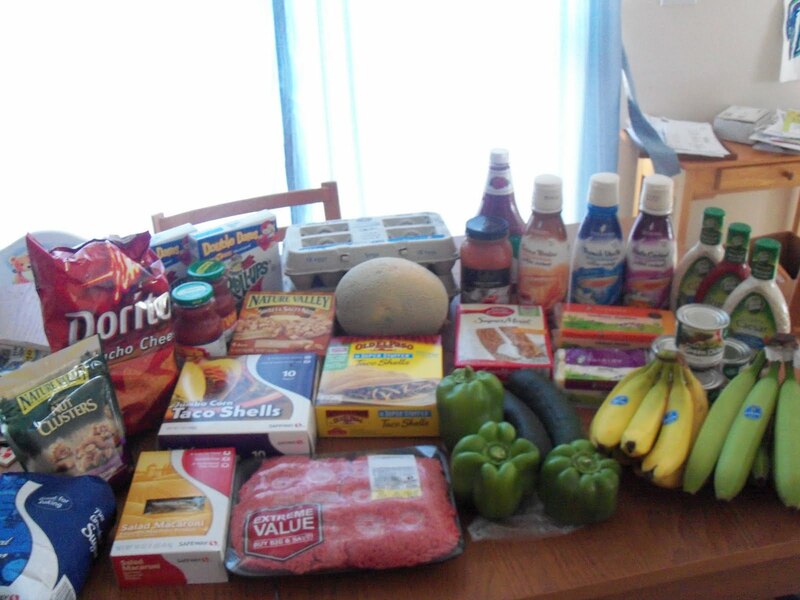 I also sent away for a $10 mail-in rebate making all this cost only $11.16 including the cost of a stamp. The best deal at TOP was the 8 boxes cereal & 2 packages of Keebler cookies which ended up costing $.19/each after sale, man. coupons, the $5/25 coupon and the mail-in rebate. I got lots of Raisin Bran, but was bummed the store was out of Rice Krispies which my girls love. I am hoping to find Rice Krispies at a great price sometime in the back-to-school sales. I had some great Safeways coupons I received in the mail (along with the $10/50 coupon) and their ad coupons were great this week, too. The best deals were free pasta, pasta sauce, taco shells, and ketchup. I also got quart sized creamer for $1.19 each, Wishbone salad dressing for about $.46 each, and a carrot cake mix with a tub cream cheese frosting for $1.20 for the pair. You can see the rest in the photo, but those listed are my favorite deals. If you want to hit Safeway by Tuesday you can get cucumbers and bell peppers for $.50 each and canteloupe is $.99 per melon. The menu plan is a little up in the air. I have plenty of groceries and produce and had several meals I planned to make this week, but it's been so hot I don't want to cook at all! I just realized I should start reserving my freezer meals for use after the baby's arrival, so I can't fall back on those. Here's the tentative plan for dinners. Egg salad sandwiches (this isn't your normal egg salad), stuffed bell peppers with corn on the cob(cook rice the night before), Mexican dip & chips (I can make this ahead of time and reheat in the microwave), Sour cream chicken over rice, Taco Salad (cook meat night before), Pasta salad & cold chicken, Quesadillas. I also planned to make chicken pot pie and lasagna this week, but I don't want to bake either of those in the heat. If I can find time I'll go ahead and put those together, then put them in the freezer. Lunches are just going to be whatever I have in the fridge and need to use up. Leftovers, sandwiches, fruits & veggies, etc. DH has been very understanding the last few days about the heat and how it's been affecting my pregnant self. Last night we just ate bagels, canteloupe, and applesauce for dinner. The girls were a little confused, but they ate the cold dinner just fine so I'm hoping they'll continue to be flexible.